WikiLeaks has released almost 800 secret documents from US military prison Guantánamo Bay, but former media partner the Guardian was "double-crossed" by the whistleblowers site over the leak, according to investigations editor David Leigh. The Guantánamo Files, published today, are understood to be part of the large trove of documents allegedly passed to WikiLeaks by US intelligence officer Bradley Manning. The Guardian and the New York Times were forced to obtain their copy of the documents from another source after Julian Assange turned his back on his early media partners in favour of the Daily Telegraph, Washington Post, Al Jazeera, and others. The New York Times was able to obtain the documents via another source in advance of the release however, and passed them on the Guardian and National Public Radio in the US. Leigh, who has worked closely on all of the newspaper's coverage of WikiLeaks, confirmed to Journalism.co.uk this morning that Julian Assange had cut the Guardian out of the loop for the first time. "This is all because of Julian Assange's feuding with the Guardian and the New York Times, and what he's decided to do now is cut us out of it and distribute the files to a range of right-wing newspapers, including the Telegraph"
Asked if he thought the move marked the end of the relationship between the Guardian and WikiLeaks, which begun the whistleblowers' work with mainstream media, Leigh said: "Well, when people try and double-cross you, that probably is the end of a relationship." Writing on the Guardian's liveblog this morning, Leigh said that Assange had gone back on a deal with the newspaper concerning the files allegedly leaked by Manning as a result of the Guardian's coverage of allegations of sexual misconduct levelled against Assange in Sweden. According to the NYT this morning, the Guantanamo Files were "made available to The New York Times by another source on the condition of anonymity". The Guardian reports that the files were then "shared with the Guardian and National Public Radio, which is publishing extracts, having redacted information which might identify informants". Assange has claimed several times in the past few weeks that WikiLeaks is preparing to sue the Guardian over its book on the relationship, penned by Leigh and Moscow correspondent Luke Harding, but Leigh said today that the claims are a "falsehood". "We've recieved no writ, no lawsuit, nothing. Every time Assange gets asked an awkward question he deflects it with this stuff about suing us, but it's not true." The Guantanamo files are the fifth and, according to Leigh, "very nearly final" tranche of documents leaked by Manning. They follow the Iraq war logs and Afghanistan war logs, and later the US embassy cables. Following a public falling out between WikiLeaks and the New York Times last year, the NYT was forced to obtain its copy of the US embassy cables from the Guardian. 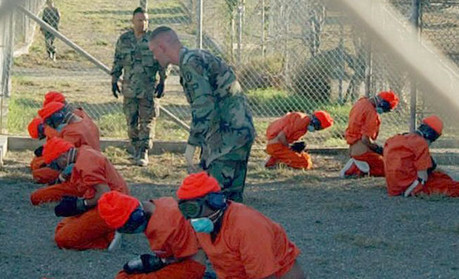 The files themselves contain information from the Joint Task Force at Guantanamo Bay (JTF-GTMO), including recommendations about whether prisoners should continue to be held, or should be released (transferred to their home governments, or to other governments), along with information about interrogations, health assessments, and images of most of the 171 prisoners still detained in the camp. They also reveal more information about an Al Jazeera journalist who was detained at Guantánamo Bay for six years, showing that he was held in part in order to be interrogated about the Arabic news network.